Saturday 17th February Ayr United U15 Girls travelled to Paisley to take on St Mirren in their second preseason friendly of 2018. Ayr dominated possession for the opening quarter, linking up well in the middle of the park to coordinate plenty of attacks forward, but the St Mirren goalkeeper commanded her area well to keep the score line level. On fifteen minutes Ayr finally got the breakthrough they had been looking for, thanks to an excellent through ball by Armani Fulton (pictured) directly into the path of the awaiting Kelsie Bradley who struck the ball expertly from twenty yards out, chipping the goalkeeper dipping the ball into the back of the net. Ayr continued to press on with their high line approach but were punished in the closing stages when St Mirren caught them out on the break to level the score. After the restart both teams struggled to retain possession as the match turned into a midfield battle of wills. St Mirren used this to their advantage first by grabbing their second goal, once again on the counter, after Ayr had worked well to create another promising attack on goal. In the final ten minutes Ayr went all out in search of the equaliser when Libby MacLeay got onto the end of a Kelsie Bradley cross but the St Mirren goalkeeper was brave in coming out to claim the ball. Lisa Forrest then turned the St Mirren full back with her quick feet to guide a shot at goal but this strike was also denied. 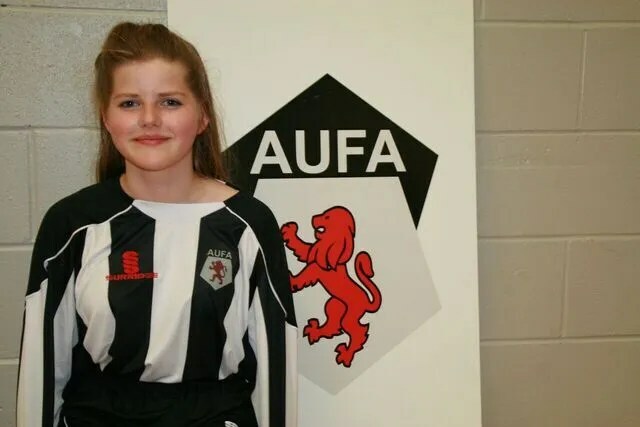 Honour Stewart-Fairbairn came agonisingly close to levelling the score after her pace and skill slipped her in behind the host’s back line, but as she had proved all game, the St Mirren goalkeeper was more than capable of keeping her goal clean. Overall, this was an exciting well matched football game, with lots of neat football played by both sides as we look forward to the competitive league commencing very soon!